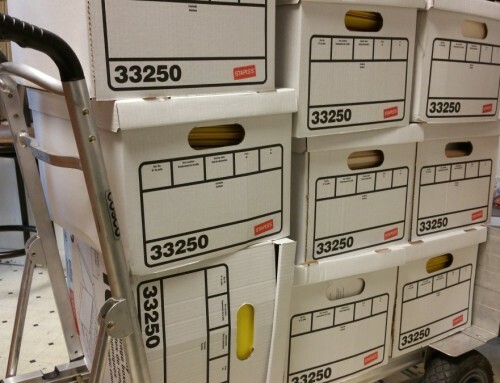 Boston Massachusetts and New Hampshire area residents have a new choice for their Personal document shredding service, unlike the other large corporations, our company offers area residents a chance to safely shred their material at some of the lowest prices in Boston MA and New Hampshire. 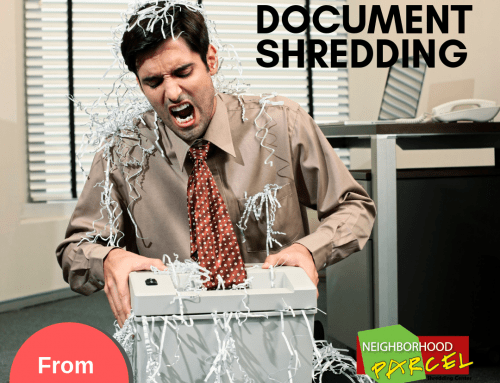 Our Residential Document Shredding service offers residents and small home based businesses the opportunity to safely shred documents and comply with all HIPAA and Massachusetts privacy laws. 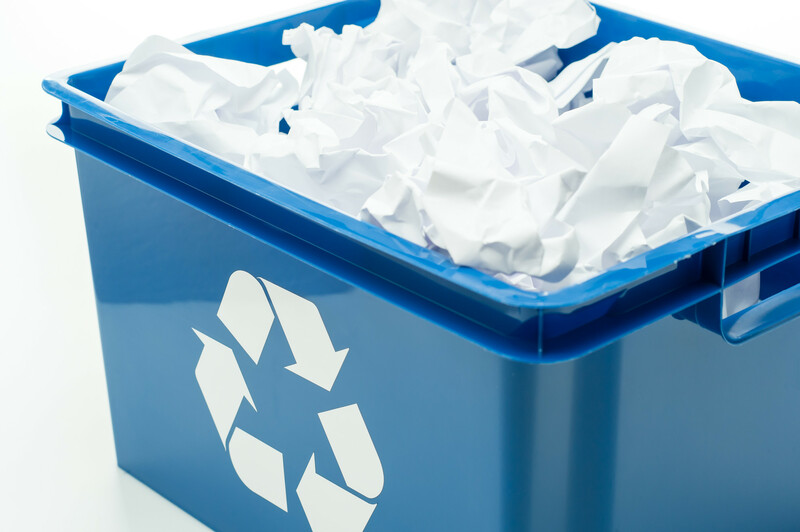 Convenient Service: We operate our shredding service business with your convenience in mind, we operate seven days a week and after hours. 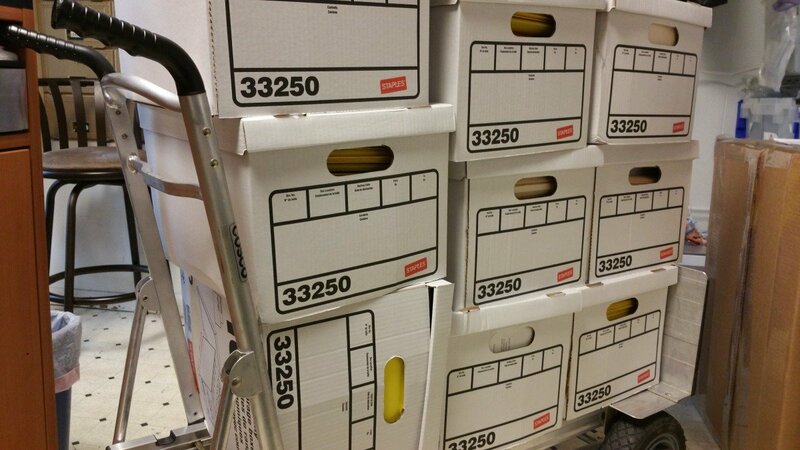 We schedule our truck to show up at your facility and remove all your material at a time that is convenient for you. This is subject to availability. 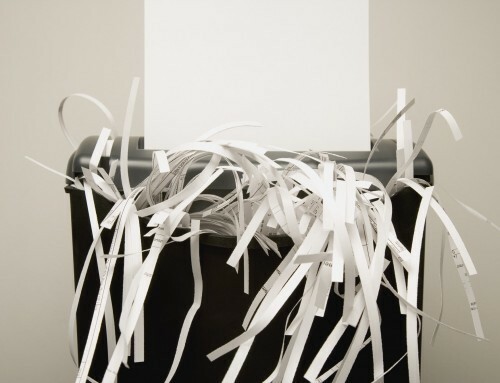 Usually, off-site shredding service can be scheduled within 24 Hrs. The area resident who can drop off their documents and material at Tewksbury MA office can do so any time without preset appointments. Low Flat Rates: We love to save people money! We have low overhead, we believe in fair pricing. Unlike the other big company, we pay no royalty fees, no Multi-million dollar CEO’s and no greedy stockholders! 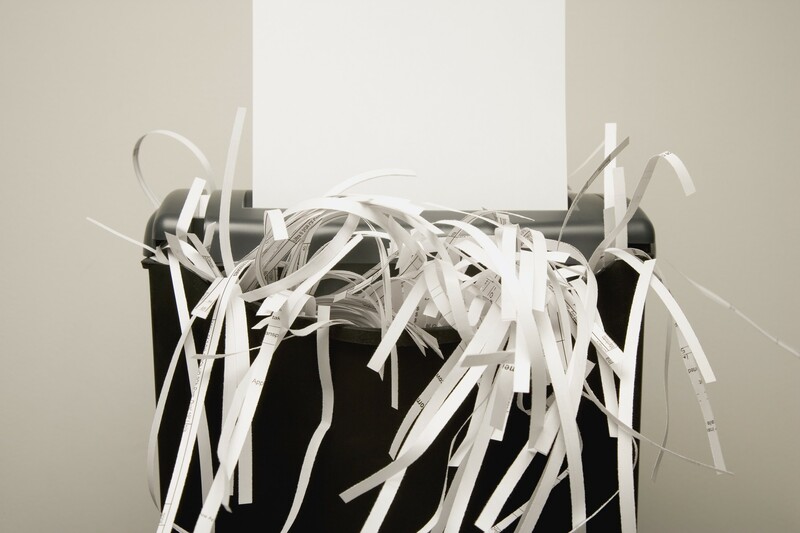 Our shredding flat rates are guaranteed to save you money. Our flat rates can be as low as 89¢ / Lbs. No hidden fees, no transportation charges, and no contracts. Pay as you go. 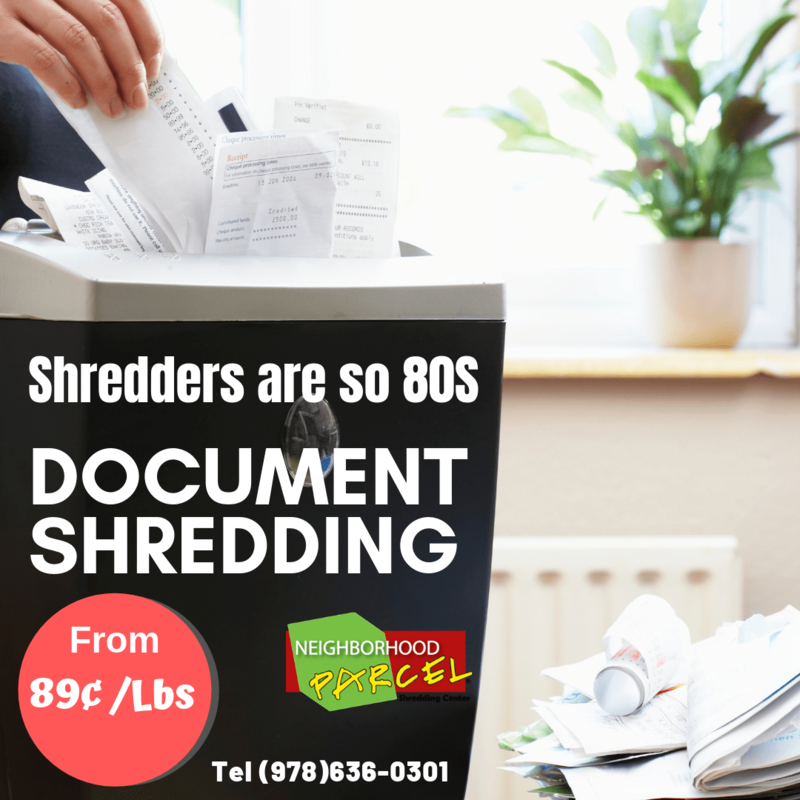 Choice: We make Residential Shredding Service simple and affordable! 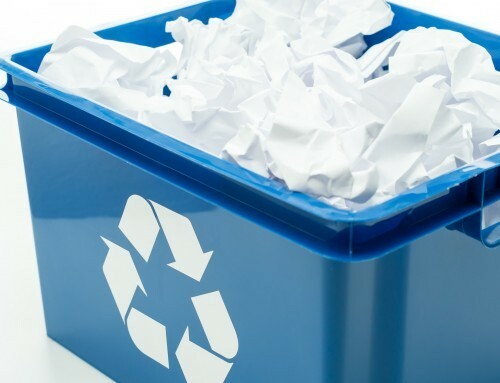 Other big companies may not be interested in your business because they are focused on Business to business, our company, on the other hand, is eager to help you shred your material in safe and economical manner. 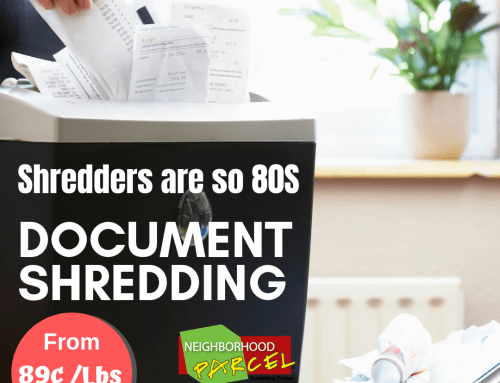 Area residents from MA, NH, ME and RI have a choice when it comes to residential shredding service: Drop Off or Off-Site Shredding. Both options are guaranteed to save you money. 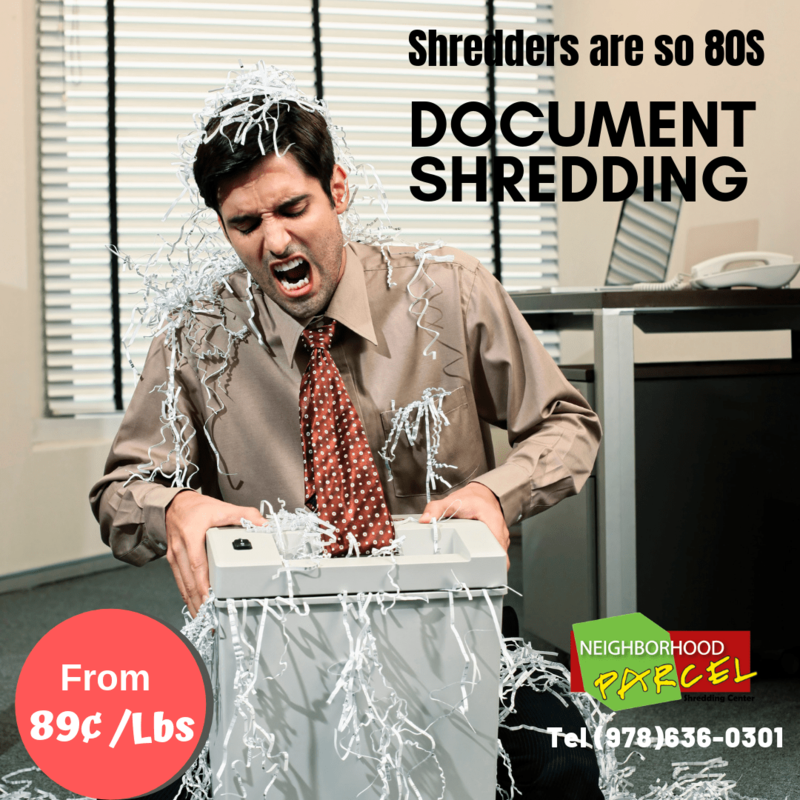 Book your next Residential or small business shredding service today and save! Abington Acton Acushnet Adams Agawam Alford Amesbury Amherst Andover Arlington Ashburnham Ashby Ashfield Ashland Athol Attleboro Attleborough Auburn MA, Avon MA, Ayer Barnstable Barre Becket Bedford Belchertown Bellingham Belmont Berkley Berlin Bernardston Beverly Billerica Blackstone Blandford Bolton Boston MA, Bourne Boxboro Boxborough Boxford Boylston Bradford Braintree Brewster Bridgewater Brimfield Brockton Brookfield Brookline Buckland Burlington Cambridge MA, Canton Carlisle Carver Charlemont Charlestown Charlton Chatham Chelmsford Chelsea Cheshire Chester Chesterfield Chicopee Chilmark Clarksburg Clinton Cohasset Colebrook Colrain Concord Conway Copake Cumberland Cummington Dalton Dana Danvers Dartmouth Dedham Deerfield Dennis Dighton Douglas Dover Dracut Dudley Dunstable Duxbury East Bridgewater East Brookfield East Longmeadow Easthampton Easton Edgartown Egremont Enfield Erving Essex Everett Fairhaven Fall River Falmouth Fitchburg FloridaFoxborough Framingham Franklin Freetown Gardner Gay Head Georgetown Gill GloucesterGoshen Gosnold Grafton Granby Granville Great Barrington Greenfield Greenwich Groton Groveland Hadley Halifax Hamilton Hampden Hancock Hanover Hanson Hardwick Harvard Harwich Hately Hatfield Haverhill Hawley Heath Hillsdale Hingham Hinsdale Holbrook Holden Holland Holliston Holyoke Hopedale Hopkinton Hubbardston Hudson Hull Huntington Hyde Park Ipswich Kent Kingston Lakeville Lancaster Lanesborough Lawrence Lee Leicester Lenox Leominster Leverett Lexington Leyden Lincoln Littleton Longmeadow Lowell Ludlow Lunenburg Lynn Lynnfield Malden Manchester Mansfield Marblehead Marion Marlborough Marshfield Mashpee Mattapoisett Maynard Medfield Medford Medway Melrose Mendon Merrimac Methuen Middleborough Middlefield Middleton Milford Millbury Millis Millville Milton Monroe Monson Montague Monterey Montgomery Mount Washington Nahant Nantucket, Nashua NH, Natick Needham New Ashford New Bedford New Braintree New Marlborough New Salem Newbury Newburyport Newton Norfolk North Adams North Andover North Attleboro North Attleborough North Brookfield North Canaan North Hadley North Reading North Smithfield Northampton Northborough Northbridge Northfield Northridge Norton Norwell Norwood Oak Bluffs Oakham Orange Orleans Orton Otis Oxford Palmer Paxton Peabody Pelham Pembrook Pembrooke Pepperell Peru Petersham Phillipston Pittsfield Plainfield Plainville Plymouth Plympton Prescott Princeton Provincetown Quincy Randolph Raynham Reading Rehoboth Revere Richmond Rochester Rockland Rockport Rowe Rowley Royalston Russell Rutland Salem MA, Salem NH, Salisbury Sandisfield Sandwich Saugus Savoy Scituate Seekonk Sharon Sheffield Shelburne Sherborn Shirley Shrewsburty Shrewsbury Shutesbury Somers Somerset Somerville South Hadley Southampton Southborough Southbridge Southwick Spencer Springfield Sterling Stockbridge Stoneham Stoughton Sturbridge Sudbury Suffield Sunderland Sutton Swampscott Swansea Taunton Templeton Tewksbury Tisbury Tolland Topsfield Townsend Truro Tyngsborough Tyringham Upton Uxbridge Vernon Wakefield Wales Walpole Waltham Ware Wareham WarehamHarrisburg Warren Warwick Washington Watertown Wayland Webster Wellesley Wellfleet Wendell Wenham West Boylston West Bridgewater West Brookfield West Newbury West Springfield West Stockbridge West Tisbury Westborough Westfield Westford Westhampton Westminster Weston Westport Westwood Weymouth Whatley Whitingham Whitman Wilbraham Williamsburg Williamstown Wilmington Winchendon Winchester Windsor Winthrop Woburn Woonsocket Worcester Worthington Wrentham Yarmouth.